Chalet of the Fountain. A corner of quiet and silence in contact with nature. 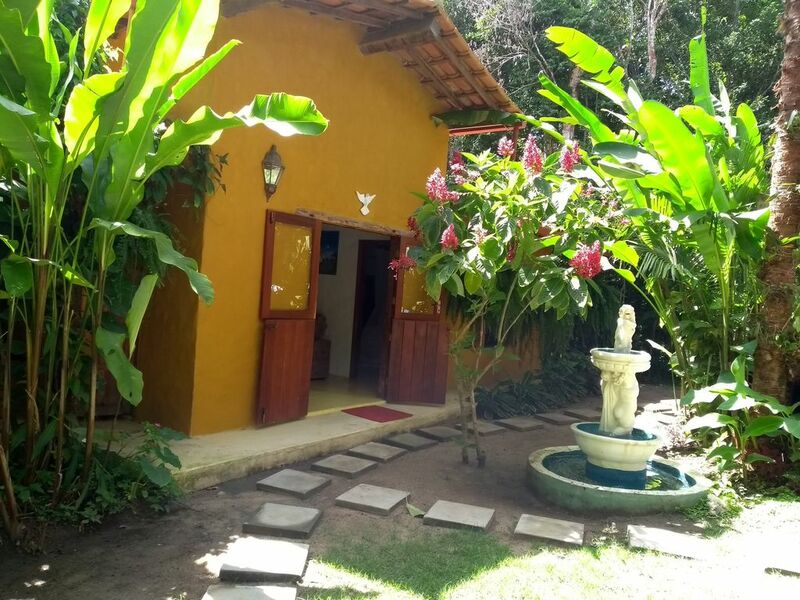 A charming chale from the garden odOYÁ House hotel that sleeps 4 to 5 people. Charming cottage of the Garden odOYÁ House Hotel. Located amidst a beautiful tropical garden with exotic plants and flowers, tilapia pond and a beautiful fountain in front of the cottage. It has two Queen Size Suites with private baths, plus a cozy living room and a kitchen with Cooktop, Frost Free refrigerator, electric oven, coffee maker and utensils for your comfort. The wooden doors of the chalet open onto a lush garden at the bottom of the common area of ​​the property, consisting of a wooden deck with swimming pool, an artesian well water shower and an outside kitchen. The chalet borders, at the back with an extensive area of ​​native forest that gives access to the River of the Mares. The silence of the woods along with the watery noise of the fountain is an invitation to relaxation. Wild animals such as monkey star, monkey nail, squirrels, lazy beast and various specimens of birds and butterflies are routine visitors to the OdOYA garden and cottage. The bucolic surroundings of the property due to tranquility and tree-lined streets are an incentive for long walks. A paradise in paradise, less than a 7-minute walk from Trancoso's Historic Square.